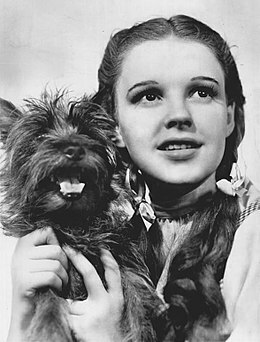 Terry (November 17, 1933 – September 1, 1945) was a female Cairn Terrier performer who appeared in 16 different movies, most famously as Toto in the film The Wizard of Oz (1939). It was her only credited role, though she was credited not as Terry but as Toto. She was owned and trained by Carl Spitz. Terry, born in the midst of the Great Depression, was trained and owned by Carl Spitz. Her first film appearance was in Ready for Love (1934) which was released on November 30, 1934, roughly one month before her first major film appearance, with Shirley Temple, in Bright Eyes (1934) as Rags. She did her own stunts, and almost lost her life during the filming of The Wizard of Oz (1939), when one of the Winkie guards accidentally stepped on her foot, breaking it. She spent two weeks recuperating at Judy Garland's residence, and Garland developed a close attachment to her. Garland wanted to adopt her, but Spitz refused. Her salary, $125 per week (equivalent to $2,200 in 2018), was more than that of many human actors in the film, and also more than most working Americans at the time. She attended the premiere of The Wizard of Oz at Grauman's Chinese Theater; because of the popularity of the film, her name was changed to Toto in 1942. She had 16 total film appearances, three of which were playing in theaters at the same time in the fall of 1939: The Wizard of Oz, The Women, and Bad Little Angel. Her last one was Tortilla Flat (1942), in which she was reunited with Oz director Victor Fleming and Frank Morgan, who played the Wizard. Terry was the mother of Rommy, another movie Cairn terrier, who appeared in other films including Reap the Wild Wind (1942) and Air Force (1943). Terry died at age 11 in Hollywood on September 1, 1945, and was buried at Spitz's ranch in Studio City, Los Angeles. The grave was destroyed during the construction of the Ventura Freeway in 1958. On June 18, 2011, a permanent memorial for Terry was dedicated at the Hollywood Forever Cemetery in Los Angeles. Bright Eyes (1934) as "Rags"
Bad Little Angel (1939) as "Rex"
^ Choron, Harry; Choron, Sandra (2005). Planet Dog: A Doglopedia. Mariner Books. p. 50. ISBN 978-0-618-51752-7. Retrieved 2014-01-23. ^ Lloyd, Ann (2003). Hollywood Dogs. Barron's Educational Series. p. 6. ISBN 978-0-7641-5720-2. Retrieved 2014-01-23. ^ Powe Allred, Alexandra (2004). Dogs' Most Wanted: The Top 10 Book of Historic Hounds, Professional Pooches, and Canine Oddities. Potomac Books Inc. pp. 156–157. ISBN 978-1-57488-801-0. Retrieved 2014-01-23. ^ Bush, Karen (2007). Everything Dogs Expect You to Know. New Holland Publishers Ltd. p. 79. ISBN 978-1-84537-954-4. Retrieved 2014-01-23. ^ "The "Famous" Cairn Terrier Movie List". Retrieved 2014-01-23. 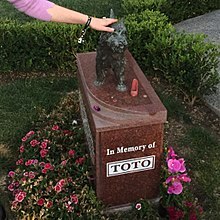 ^ a b "HOLLYWOODLAND » Blog Archive » Toto finds a home at Hollywood Forever". Allanellenberger.com. June 18, 2011. Retrieved September 18, 2012. Wikimedia Commons has media related to Terry (dog). This page was last edited on 9 March 2019, at 04:22 (UTC).